Word 2007 thru 2019 are so similar that I've decided that I don't need to re-record my original 2007 lessons. They would be almost identical. If you're using any of these versions you should be perfectly fine taking my 2007 lessons. Not sure? 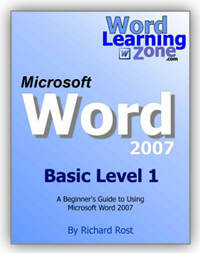 Try Word 2007 Level 1 today and if you're not happy with it, I'll refund your money. I will be updating my Word lessons soon, and when I do, you'll get a free upgrade. teaching Word in the classroom since 1994.
the new interface? See what you're missing. Microsoft Word 2007. Over 2 Hours! or Access as a data source. Mass Email with Outlook. More. If you are looking to learn Microsoft Word, you've come to the right place. Our step-by-step video lessons will teach you how to master Microsoft Word, so that you can create professional-looking documents to impress your friends, family, and customers.